To most Chinese people, noodles are the one staple that’s considered a necessity of life. To most Chinese people, noodles are the one staple that’s considered a necessity of life. The oldest trace of Chinese noodles was a 4,000-year-old find unearthed at the Lajia archeological site in northwestern China. Scientists determined it was made from two kinds of millet that were ground into flour to make the dough. The earliest written record of noodles dates to the Han Dynasty (206 BC-AD 220) when it became established as a staple. But it’s almost impossible to name every single variety of noodles in China. Depending on the ingredients, craftsmanship, cooking method and place of origin, noodles that share similar appearance may turn out to be very different from each other. This week, we’ll delve into some popular handmade noodles. Noodle is a necessity of life in China. Pulling noodles from dough by hand was the ancient way before machines and other methods were developed. Also called lamian in Chinese, hand-pulled noodles were born in northern China as a staple that can be cooked in many ways. First, the famous Lanzhou beef noodle, Xinjiang hand-pulled noodle and Henan stewed noodle are all made by hand using different techniques. Even for celebrity UK chef Gordon Ramsay, making hand-pulled noodles is not an easy task —as he once learned and tried in 2008 at Noodle Oodle, a Shanghainese restaurant in London specializing this style of noodle. To make the hand-pulled noodles, the dough must be twisted, stretched and folded repeatedly into a growing number of strands. The length and thickness depends on the number of folds. The thinnest hand-pulled noodle is the “dragon’s whiskers.” Dough must be folded and pulled until more than 16,000 strips of thin noodles are created. If pulling noodles wasn’t already enough of a challenge, top noodle makers can even perform dances while working. "Dragon’s whiskers" is the thinnest hand-pulled noodle. The Henan stewed noodle uses a flat, thick stretched noodle that uses a different technique from the repeated pulling process of making lamian. The soul of a good stewed noodle is the lamb broth. In the markets in Henan, one can buy pre-made dough pieces coated with vegetable oil and make the stretched noodles at home. The Xinjiang-style noodle is not as thin as the typical Lanzhou style. The thick and chewy noodles are traditionally stir-fried with lamb and vegetables. Biangbiang mian is a wide, thick hand-pulled noodle that’s shaped like a belt. The Chinese character, with 57 strokes, for biang cannot be typed, hence it’s often written in pinyin. The noodle is much simpler to make than the common lamian. After the dough is separated into smaller strips, it’s coated with oil and covered with plastic wrap to rest for 15 minutes. Then the strips are rolled to the shape of an ox tongue and pulled evenly on both ends. Sometimes the noodles can reach 50 centimeters in length. Biangbiang mian is served with a simple hot chili sauce made by splashing hot oil onto ground chilies. Biangbiang mian is a spicy thick noodle in Shaanxi Province. A unique hand-pulled noodle called “one noodle” can be found in Chengdu. Each bowl contains exactly one long noodle that’s hand-pulled from the dough. The noodle maker pulls the dough into a noodle and throws it directly into boiling water. Couples often share a bowl of “one noodle” by picking up each end and eating all the way to the middle. 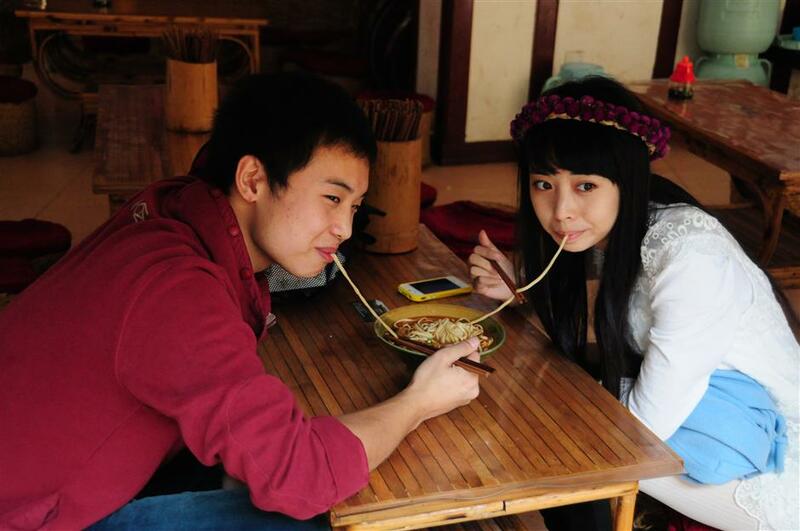 A young couple shares a bowl of “one noodle” in Chengdu. For home kitchens, pulling noodles by hand is still a challenging task. For everyday cooking, hand-rolled noodles are the answer because they are relatively easy to make with just flour and water. One notable hand-rolled noodle is the Sichuan-style dandanmian, which uses a dough of wheat flour, egg and water to make thin noodles that are then boiled and served with a rich, spicy sauce. 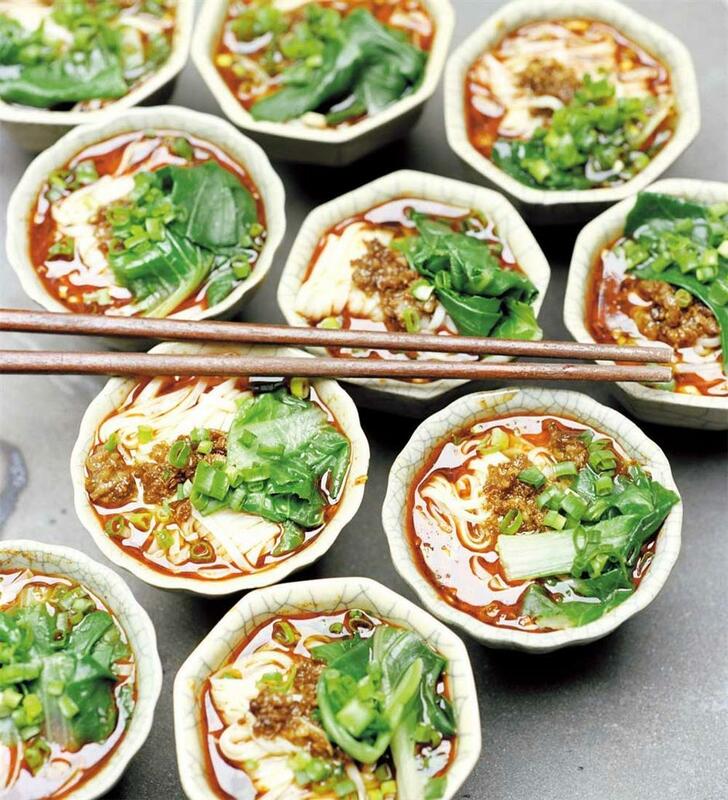 The Qishan noodle with minced meat topping in Shaanxi is a local staple — incredibly thin flat hand-rolled noodles with a smooth surface. When cooking, fresh hand-rolled noodles are favored for their wet and chewy texture. The ones with a larger surface area can cling onto the rich flavors of sauces, while the thin noodles are perfect for soups. Like Italian pasta, Chinese noodles are not always thin and long. Daoxiaomian, or noodle shaved by knife, is a very popular flat noodle from Shanxi Province. It’s deemed one of China’s top 10 noodles and can be found in noodle shops across the country. To make daoxiaomian, the first step is to make the large dough in a ratio of 150 grams of water for each 500 grams of flour. After mixing them together, cover the container with wet cloth so the flour can rest a little before being rolled into a dough. The knife used to slice the noodles off the dough is not a common cutting knife, but a special arc-shaped cutter. The craftsmanship is critical in making high-quality daoxiaomian that’s neither too thick nor too thin, which requires moderate strength and a sense of rhythm to make every piece even. Experienced chefs can shave the noodles very quickly and it’s a joy to watch all the noodles fall into the boiling water seamlessly. Daoxiaomian is served with a variety of toppings including minced meat, egg, black fungus and tomatoes as well as bean sprouts and cucumber slices. A touch of aged vinegar is essential to give the dish the unique Shanxi flavor. The most famous daoxiaomian is found in the city of Datong. Here, the success or failure of a noodle shop depends on its minced meat topping recipe. Although daoxiaomian is often cooked with fresh noodles, the dried form is also available for home cooks who want to recreate the delicacy. And now, even robots have been developed to make daoxiaomian. 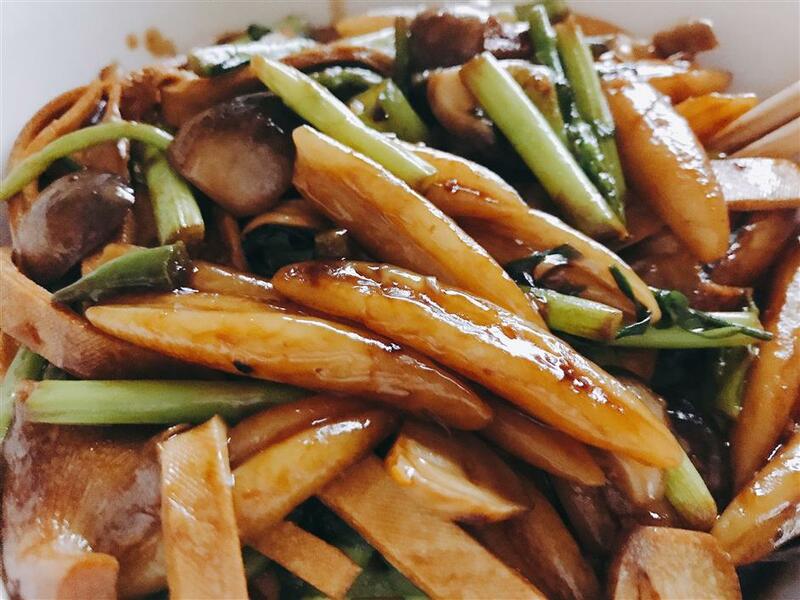 Daoxiaomian is a popular flat noodle from Shanxi Province that can be stir-fried or served as soups. Cat’s ear noodle, or mao erduo, is a traditional noodle in Shanxi and Shaanxi that’s named after its unique shape which resembles cat’s ears. After rolling the dough into a long strip and cutting it into small pieces the size of a fingernail, press the tiny dough on the kitchen board with a thumb and push upward so that it rolls to form one cat’s ear noodle. It’s easy and fast to make. To cook cat’s ear noodles, simply boil them in hot water while making a simple stir-fry of desired meats and vegetables, toss the noodles in the wok to coat them evenly with the sauce. Mashi is an alternative name for cat’s ear noodle in Shaanxi. It’s often served as a soup noodle in a sour broth made with tomatoes. Cat’s ear is also found in Hangzhou and often in stir-fried. Cat’s ear also refers to a snack in which flour chips are fried in a swirling pattern. Mao erduo, or cat's ear noodle. In Shanxi, jiupian is a similar noodle made by pulling small pieces from the dough and boiling it in water. The thick noodles have a very chewy texture. Miangeda, or dough balls, is the Chinese version of the Italian gnocchi. The small pieces of dough are mostly served in soup style with vegetables. Fish noodle is a dough ball shaped like small fish or tadpoles, which can be stir-fried with meat and vegetables. In Shanghai, fish noodle can be found in some stalls in the wet markets.